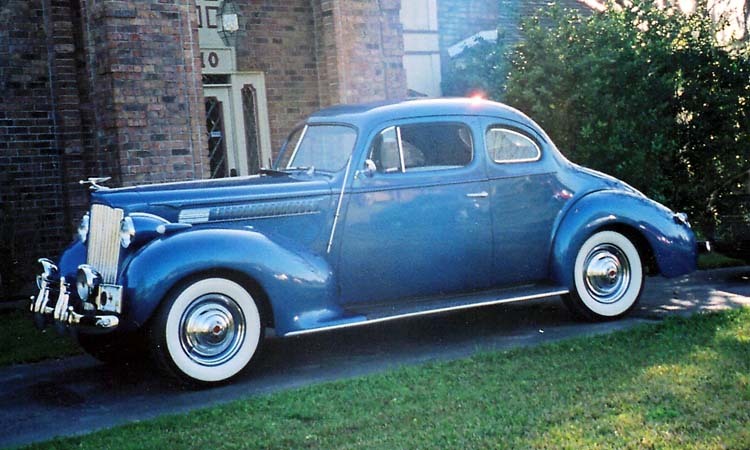 This 1939 Packard Six Business Coupe was found as junk in a warehouse near Baton Rouge in 1981. It was literally a wreck requiring a complete restoration front to rear and top to bottom. The car was part of the estate of an old gentleman engineer who died in 1980. Carolyn, my wife, and Laura, our daughter, and I knew the original owner and we thought the restoration would be a great family project. And it was. The restoration took four years, but it was well worth the effort. The car is very interesting in that it is a junior business coupe, but it has some features of the senior cars: column gear shift, radio, clock, banjo steering wheel, and deluxe door and window handles, all from the factory. But the first owner just wore it out by pulling trailers, mowers, plows, rakes, trees, and who knows what else. This Packard has known paved roads, shell and gravel roads, dirt roads and no roads in its day. It was bought to be used, even as a tractor. However, now it is in our garage, dry and polished and I am sure swapping tall tales with our 1955 Four Hundred and chuckling about how our daughter, Laura, learned to drive a stick shift looking out over that long hood. All Packards truly have a personality.